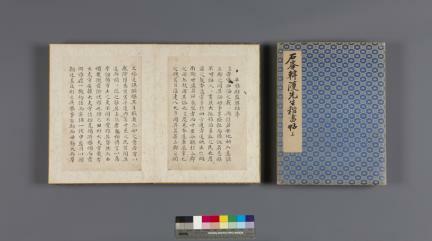 『한호 필적-석봉한호해서첩(韓濩 筆蹟-石峯韓濩楷書帖)』 상·하 2첩은 선조연간의 명필 석봉(石峯) 한호(韓濩, 1543-1605)가 절친했던 간이당(簡易堂) 최립(崔岦, 1539~1612)의 시문 21편을 단정한 해서로 필사한 것이다. 하첩 뒤쪽에는 이백(李白)의 오언시 한 수를 초서로 쓴 필적이 더 있다. 장황은 근대의 것으로 “석봉한호선행해서첩(石峯韓濩先生楷書帖)”이란 제첨(題僉)은 서화상(書畵商) 원충희(元忠喜)가 썼다. 한호의 해서 필적으로는 호성공신(扈聖功臣)과 선무공신(宣武功臣)의 교서(敎書)를 쓴 것 등이 전하고 있는데 이들 필적은 승문원(承文院) 사자관(寫字官)으로 입신했던 한호의 독특한 서풍을 잘 보여준다. 이런 점에서 이번 작품과 같은 「석봉한호해서첩」은 사자관 한호의 글씨 전형을 담고 있다는 점에서 중요하다. 「석봉한호해서첩」은 깨끗이 보존되어 있고 필사한 양도 많으며, 또 하첩 말미에 18세기의 초서명필 만향재(晩香齋) 엄한붕(嚴漢朋, 1685~1759)의 아들 엄계응(嚴啓膺, 1737~1816)이 쓴 1803년 9월의 발문이 있어 그 가치를 더욱 높여주고 있다. 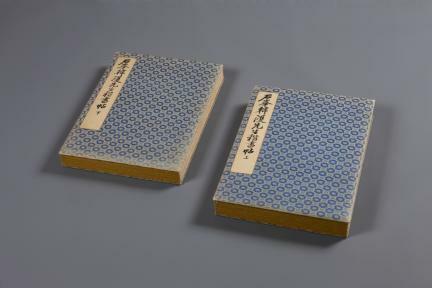 These two calligraphy albums contain 21 pieces of poetic works handwritten in regular script by Han Ho (1543-1605), one of the greatest calligraphers of Joseon, and given to Choe Rip (1539-1612), his close friend who was also the author of the verses. There is on the rear cover of the second album a five-character verse by a great Tang poet Li Bai (701-762). The title, Album of Calligraphy in Regular Script by Master Han Ho (石峯韓濩先生楷書帖), on the front cover which was made in the 20th century was written by Won Chung-hui (1912-1976), a renowned calligrapher and art collector. 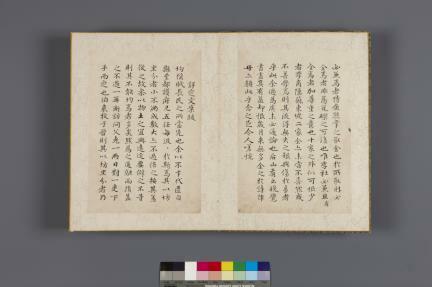 The Han Ho’s handwriting of regular script is well known by the royal certificates issued to the Hoseong and Seonmu Officials of Merit in 1604 which experts believe exhibit the characteristic style he developed during the period when he was serving as a scribe in the Office of Diplomatic Correspondences (Seungmunwon). These albums are preserved in good condition and have a quite a lot of examples. 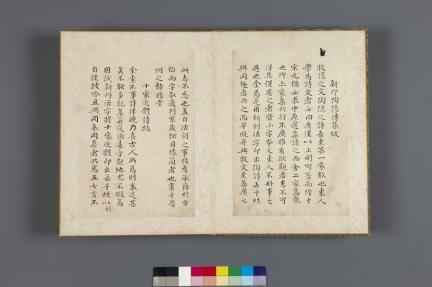 A postscript put at the end of the second volume written in the ninth month of 1803 by Eom Gye-eung (1737-1816), a son of Eom Han-bung (1685-1759) who was greatly admired as a master in the calligraphy of cursive script, adds extra value to them.